Wendy Lippe, Ph.D. is a clinical psychologist with an extensive history in the theater. Wendy was on the faculty of Harvard Medical School for over a decade and is currently a supervising clinical psychologist at Boston University. She has private practice offices in Harvard Square and Brookline. Wendy attended the musical theater B.F.A. program at Syracuse University and later changed her focus to Shakespearean tragedies and modern drama. 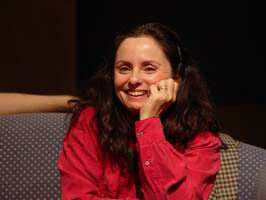 Most notably, Wendy developed and portrayed the role of a female Hamlet for three different Boston area theater companies and was featured in the Boston Globe and NPR. Lida McGirr is a longtime actor, mother and a founding member of the Little Theater on 26th Street. She won an EMACT DASH Best Actress Award for her portrayal of Martha in Who's Afraid of Virginia Woolf?, appeared as Dean Kenny in the Elliot Norton Award-winning Spinning Into Butter, and received IRNE nominations for her portrayals of Edith Frank in RCC’s production of The Diary of Anne Frank and for Alice in Bully Dance at the Boston Playwrights’ Theatre. As a director, her production of A Piece of My Heart earned four DASH nominations and won two, and as a writer, her play Dorothy Parker: Men celebrated Valentine’s Day at the Producer’s Club in New York. Goldie Eder, LICSW, BCD is a clinical social worker practicing in Cambridge, where she sees individuals, couples and families. She is a Teaching Associate at Harvard Medical School and Associate Clinical Professor at Smith College School for Social Work. Goldie programs an educational film series for social workers and others, and also assists at the Boston Jewish Film Festival, the Reel Abilities Film Festival, and at the Museum of Fine Arts, Boston, on programming in the Museum’s Disability Access Program. Goldie has a background in theatre, film and radio. William Stofega received both his B.A. and M.A. degrees from the University of Maryland at College Park. His master's curriculum focused on the literature of the English Renaissance. His thesis "Silent Rebellion, Silent Dissent: The Case of Elizabeth Cary and The Tragedy of Mariam, the Faire Queene of Jewry" explored textual disruption and social dissent during the English Renaissance. Some scholars consider Elizabeth Cary to be the first female playwright. William also directs IDC's Mobile Device research and consulting efforts on a worldwide basis.